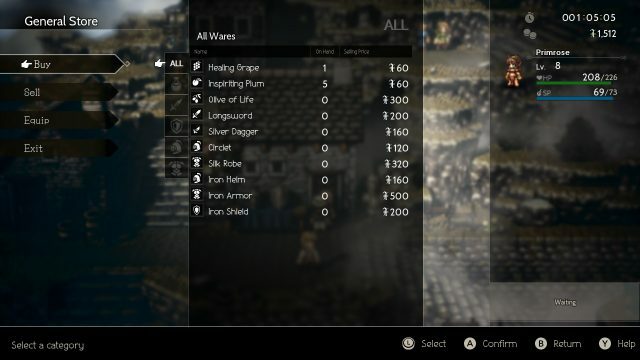 Octopath Traveler is a retro styled turn-based RPG that follows the story of eight unique characters, each of which has their own adventures and abilities. Set to launch exclusively for the Nintendo Switch on July 13th, Square Enix has created a game that can be played on a handheld device or in console format. Let’s have a closer look at what this retro styled turn-based RPG has to offer. 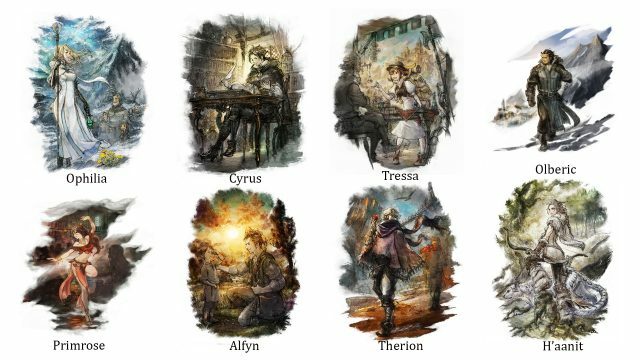 There are eight characters that are playable in Octopath Traveler each have an their own abilities. 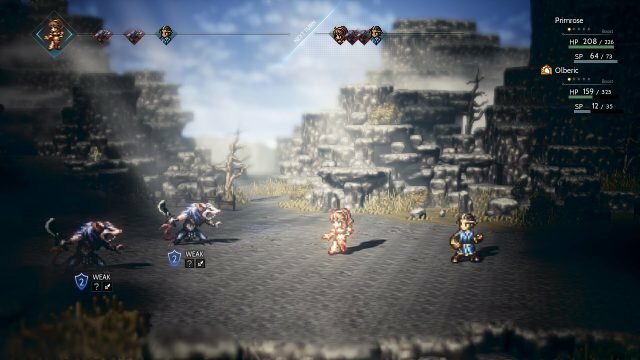 A choice of two characters are currently available in the demo, Primrose the dancer and Olberic the warrior. The 8 different characters you can play, each with their own story and unique abilities. You can only play 2 in the demo, however. All seems hopeless until a man bearing the mark of the crow enters the establishment one night. Seeing her chance to finally find a lead on her father’s death, she follows the stranger risking everything. Will she succeed in finding her father’s killers? Olberic, once a brave knight, loses his king and kingdom in a violent coup. Although dramatic, isn’t quite as bleak as Primrose’s fate, yet still shares it’s side of drama. Now with lost purpose and haunted by his past, he wanders the land in search of his new destiny, until one day a boy is capture by some rebels. Olberic must defend and save the boy from the grasp of the evil the doers, while continuing his quest to regain his honor by protecting those who need it. Will he find redemption or is he destined to wander without purpose? 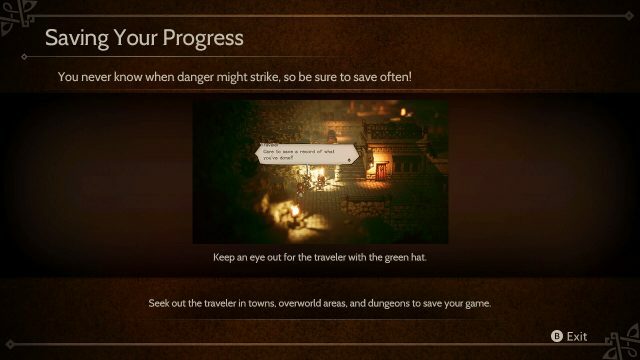 Octopath Traveler stays very much in keeping with traditional turn-based RPG, it even uses save points in the form of “travelers” which you encounter along your journey, rather than the option to save the game in the menu. You can save more than one game in the slots available giving you a chance to go back to previous versions of the game if things don’t quite go the way you planned. Saving progress as often as possible is advisable as you never when things might take a turn for the worst. 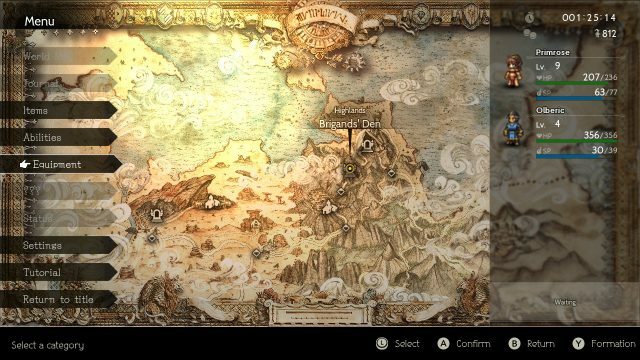 Menu layouts have a familiar feel to early Final Fantasy games, they are brought up by pressing the “Y” button rather than the dedicated “+” button which many games use on Nintendo Switch. The menu gives you the option to equip weapons/armour, use potions to regenerate HP/SP and to view your current active party members. This is also where you find your map showing the current and previous locations you have visited. Currently the demo allows you view equipment, abilities, active party and items. Each character has their own path ability, Primrose can use her charm to get NPCs to follow her allowing you summon them in battle. Olberic can challenge NPCs starting a battle, he can do this with NPCs that are usually just hanging around town. Items can be picked up opening chests or be bought from the local vendor in town. Items range from weapons to potions that can be used for battle. Each character has their own set of abilities, depending on which are in your active party, and will determine what you can use in battle. You can have up to four characters in your party at one time, including your main character. In true turn-based form, you will get a chance to use abilities, attack, defend or use items in order to fight your opponents. An added feature to this traditional style of strategy is the “boost” option, this allows you to add increased attack power and combo it during your turn. Playing Primrose I could use up to four boosts in one turn, they regenerate each turn. Abilities, although not magic-based for each character, still use SP. For example Olberic a warrior can use his Flurry which lets him use a barrage of hits in one turn, however in order use this you will need use SP. SP only regenerates after using a potion or if the character levels after the fight is over (which is the same for HP). 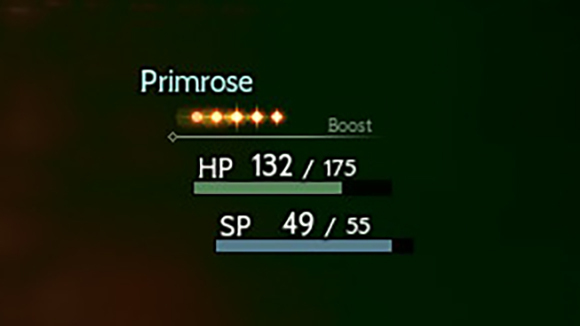 NPCs that have been charmed by Primrose can be summoned to battle, however having a limited number of turns before disappearing. 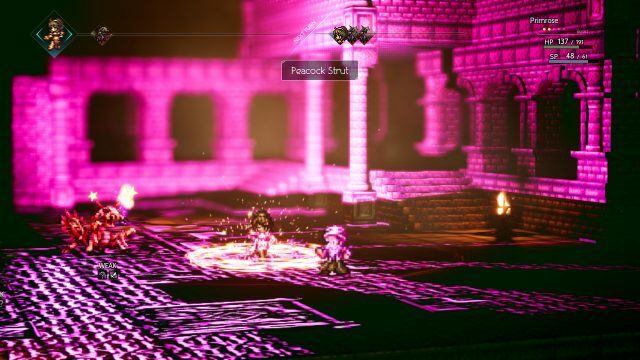 NPCs are different from your active party as you cannot choose their actions, they do not have a visible health bar and you must summon them in order to have them take part in the fight. Enemies will vary in their abilities and amount of damage they will deal, some of them also have a shield/barrier which you will have to “break” in order to deal any real damage. This allows you to find strategic ways to avoid larger damage hits as enemies become stunned after they break. Opponents will randomly pop up while venturing through areas of exploration. 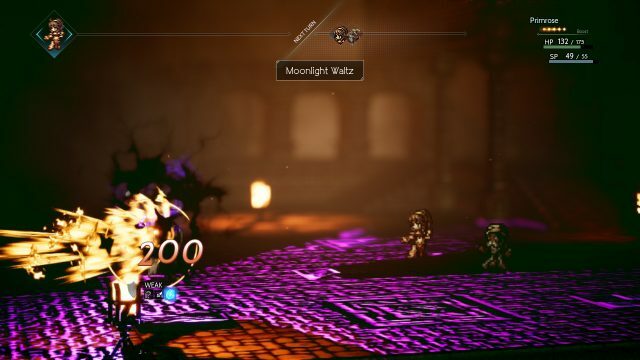 While in other RPG enemies usually have a HP bar, Octopath chooses forgo this and the player can only see the amount damage they deal to their opponent. There is no physical health bar to indicate progress, however there is a bar that shows the upcoming rotation of enemy turns which can help in planning attacks/abilities. Composer Yasunori Nishiki uses classical themed music that swells during intense battle and is somber during those dramatic moments in the story. The music suits the setting of this medieval set RPG but still has a modern twist. The style of the game is a retro pixel art but with a tilt-shift effect, buildings in the distance away are blurry while up-close objects remain sharp. 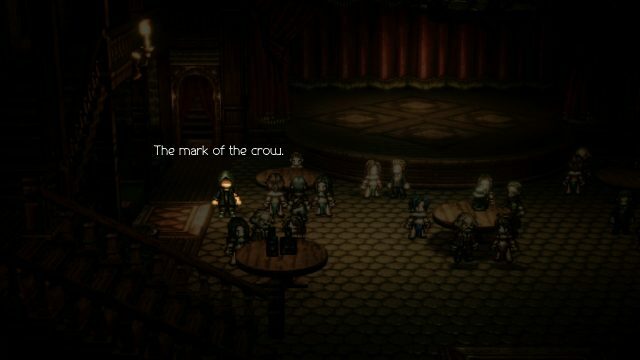 The characters are very much in the style of early Final Fantasy sprite characters and will have any fan of Square Enix games feeling nostalgic. The visual effects during in game battle are flashing beams of light and give satisfying sound effects when you destroy an enemy. Voice acting really adds to the story and matches the characters they play well. Although many of voicelines are repeated rather than following the full dialogue on screen, it does add to the immersion of the game. Noticeably the master Helgenish stood out with his sly voice that really brings the character to life, making him seem all that more menacing and loathsome. 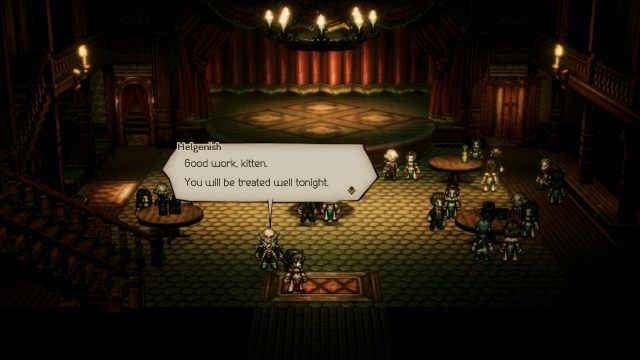 Square Enix takes what they know from previous titles and creates an RPG in retro style for this day and age, and they have the ability to tell great stories and keep players captivated. There has been feedback already from this game demo and the developers are taking this into account before the final release of the game. Hopefully one improvement they make is after dying from a battle, you go back to your previous save point. Often when this happens, you’ve just faced a boss and there’s a scene with lengthy dialogue, causing you to go through the same scenes button mashing in order to get through it and back to the fight. An option to skip the dialogue entirely for scenes you’ve already witnessed would solve this. I experienced playing the game both on handheld and on console. 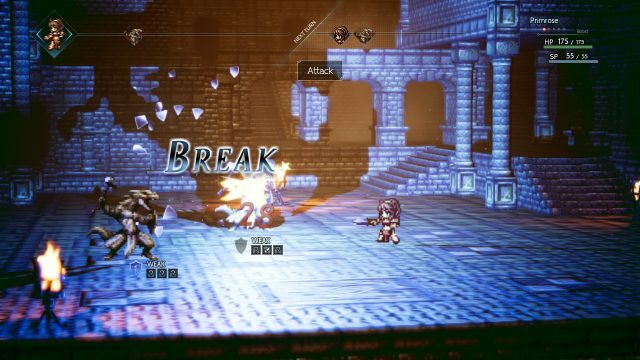 I found playing both, on a larger screen and handheld mode, suited Octopath Traveler as it doesn’t lose it’s charm whichever you play upon. Controls are pretty comfortable for turn-based strategy except for the menu button. I’m not sure why, if the game was tailor made for Nintendo Switch, does it not use the standard menu button. But it’s not a deal breaker. It’s not often you see characters that have abilities that are based on their profession rather than class. As Primrose is a dancer, all her abilities have dance related names such as Peacock Strut or Lion Dance. 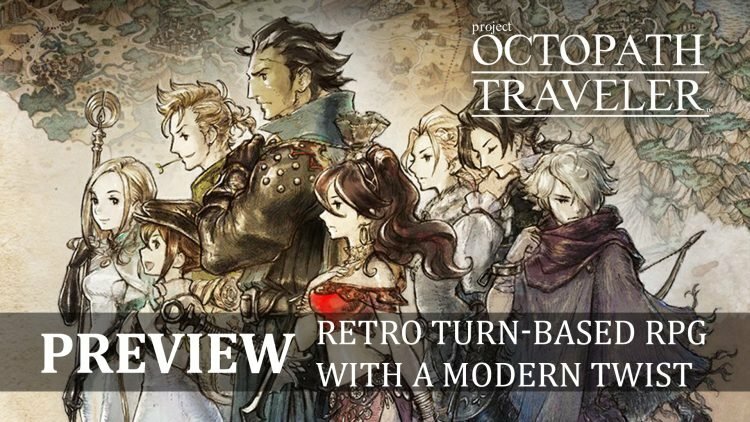 I think it’s pretty imaginative and set’s a new twist on abilities, and I believe Octopath Traveler will be an easy choice for those who haven’t played turn-based RPGs before. If you enjoy retro themed games that use traditional turn-based combat with a modern twist, and enjoy a great storyline then this could be the game for you. 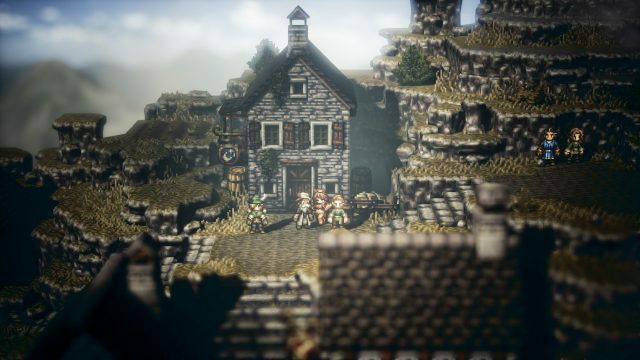 Octopath Traveler will be releasing exclusively on the Nintendo Switch on July 13th but if you can’t wait that long check out the demo, it’s free to play. If you enjoyed reading this preview be sure to check out our other upcoming games previews for Warhammer 40,000 Inquisitor – Martyr Preview, Wild Mage – Phantom Twilight Preview – Not Your Usual RPG and Dolmen Preview – When Mass Effect Meets Dark Souls.